When U.S. spy agencies eavesdrop on terrorists or foreign agents, they often come across information about U.S. citizens who are not the target of their investigation. This "incidental collection" is not illegal or improper, but specially trained intelligence officers are required to go through an established procedure to protect the privacy of U.S. persons, known as "minimization." If a national security official who receives an intelligence report feels like he or she needs to know the identity of a U.S. person in an intelligence report, that official can make a request to "unmask." The procedures for doing so are less well understood than the minimization process, but about 20 officials at the National Security Agency have the authority to approve an unmasking, NSA Director Michael Rogers told the House Intelligence Committee last month. Especially sensitive requests would come to his attention personally. "I'm the senior-most of the 20 individuals. Requests will be pushed to my level, say 'Hey, sir, we just want to make sure that you're comfortable with this,'" he said. In an interview with MSNBC…Obama National Security Adviser Susan Rice denied making requests to unmask the names of Trump associates for political purposes. She described the process as routine, but declined to say specifically how often she made requests or for what purposes. "There were occasions when I would receive a report in which a U.S. person was referred to. Name not provided, just a U.S. person," she said. "And sometimes in that context, in order to understand the importance of the report, and assess its significance, it was necessary to find out, or request the information, as to who the U.S. official was. The crown prince, Sheikh Mohammed bin Zayed al-Nahyan, arrived in New York last December in the transition period before Trump was sworn into office for a meeting with several top Trump officials, including Michael Flynn, the president's son-in-law, Jared Kushner, and his top strategist Steve Bannon, sources said. The Obama administration felt misled by the United Arab Emirates, which had failed to mention that Zayed was coming to the United States even though it's customary for foreign dignitaries to notify the US government about their travels, according to several sources familiar with the matter. 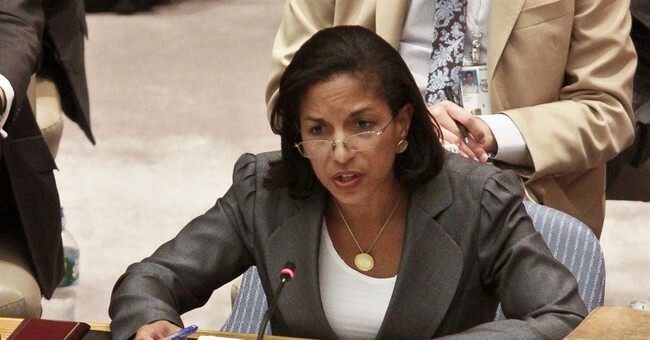 Rice, who served as then-President Obama's national security adviser in his second term, told the House Intelligence Committee last week that she requested the names of the Americans mentioned in the classified report be revealed internally, a practice officials in both parties say is common. The real issue with Rice is that of credibility. She’s a liar. She was caught lying to the public when she did the marathon Sunday morning talk show circuit (also known as the Full Ginsburg) after the Benghazi terror attack that left four Americans dead, including the late Ambassador Chris Stevens, to say a YouTube video was to blame. That was a lie. Yet, in keeping with tradition, she continues to be the “Typhoid Mary” of the Obama administration. The media tried to play this off as a diversion; though we now know she did unmask Trump officials. "She's not supposed to be doing that, and what she did was wrong. And we've been saying that and that's just the tip of the iceberg," Trump told reporters of Rice's unmasking. "What she did was wrong. Not supposed to be doing that. You know it. The unmasking and the surveillance, and I heard she admitted that yesterday. Just not right."